This Astra Model 300 pistol is a single action, semi-automatic pistol that is chambered for the 7.65 Browning(.32 ACP) cartridge but this pistol model was also offered in 9mm Corto(.380 ACP). The pistol utilizes a ramp front sight and a notch rear sight, both of which are cut into the slide and are not adjustable. It is fed by a removable single column box magazine with a 7 round capacity. The pistol has a slide hold open feature to inform the operator that the last round has been fired and to facilitate reloading when a fresh magazine has been installed. The main parts of the pistol have been finished with a rust blue while the smaller parts such as the barrel, barrel bushing, trigger, thumb safety and magazine release were highly polished and left in the white. The extractor, grip screws and lanyard ring were all heat treated to a fire blue finish. The grip panels are a checkered walnut. 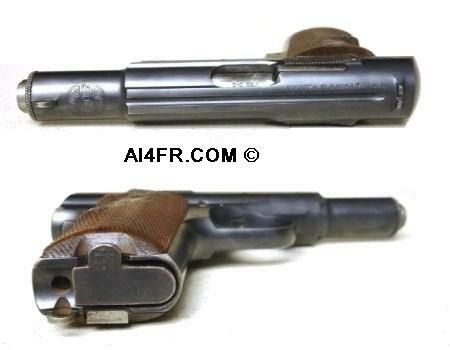 The Astra Model 300 is actually a scaled down version of the Model 400, and besides the magazine release location and the slide retention feature, it is virtually identical to its predecessor, the Astra Model 400 in functionality. Production began in 1923 with serial number 350,001, and ended in 1946 with serial number 630,475 for a total of 153,085 pistols being produced. The math is correct as blocks of serial numbers were skipped during production. Production ended in part due to the Astra Model 300 being replaced by the Model 3000. 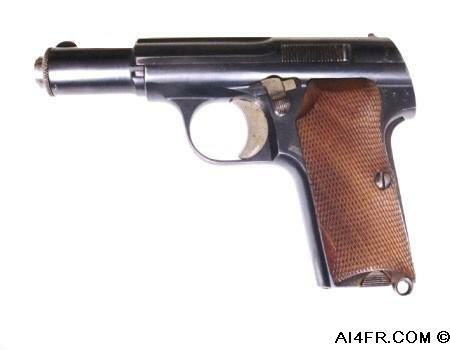 During World War 2, Nazi Germany purchased 85,390 Astra Model 300 pistols. They ordered 63,000 pistols chambered for the 9mm Kurz and 22,390 pistols chambered in 7.65mm. Only the 9mm version will have a German military acceptance stamp which is the stick eagle over WaA 251. The Astra Model 300 featured on this page is one of only 10,000 pistols that was delivered to the Nazi's on February 24, 1944. 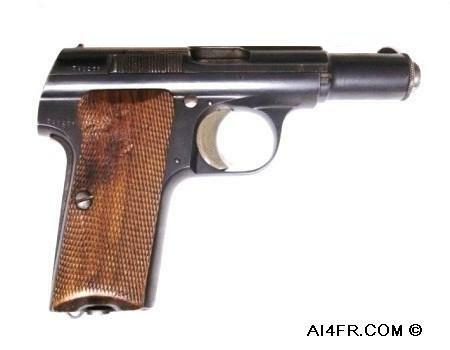 The Model 300 was never officially adopted by any branch of the Spanish military, although a number of governmental agencies did specify that it was to be their standard issue pistol. These agencies included, the Spanish prison guards(Cuerpo de Prisiones), Harbor port security(Seguridad de Puertos), the Coast Guard(Vigilancia de la Pesca), the police school in Madrid, the Spanish Navy and Naval school, various security guards, the Carabineros, the Army Artillery corps, the Euzkadian government, the German Condor Legion and many others. The Astra Model 300 was an especially popular pistol. The picture on the left shows the top and bottom of the pistol, while the photograph on the right is of the front and back of this Astra Model 300. In the bottom photograph on the left, notice the side mounted magazine release which is common to the Astra Model 300, the Model 400 that was produced for the Spanish Navy and the Model 600. On the opposite side is a small tab on the magazine floor plate use to facilitate removal of the magazine. In the bottom picture on the right we can see that this Astra Model 300 employs a grip safety. The pistol utilizes two additional safeties to include a thumb lever safety that is mounted on the left side of the frame and a magazine safety that ensures that the pistol will not fire unless the magazine is fully inserted. The photograph on the left is of the top front of the pistol and shows the Astra logo that is stamped behind the front sight. This is the late U over C Astra crest that was used after 1926. In 1926, Esperanza y Unceta was renamed to Unceta y Cia. and as a result, changes were ordered to be made in the Astra logo. The older Astra logo is thought of as the E over U or E/U logo. The stampings that are on the frame in the picture on the right are proof marks and year of manufacture marks. Starting at the left and reading towards the right, the first symbol is a knights helmet and shield with the X inside. This is the admission proof mark that appears on Spanish handguns submitted to the official government proof house in Eibar Spain after July 9, 1931. All proofing of handguns in Spain still occurs in the city of Eibar at the Banco oficial de Pruebas(official proofhouse) and the same symbol is still applied to this very day. The next stamp is the date code that is signified by a letter. In the picture above, we have the letter N with a tilde above it which is a representation of the Spanish alphabet letter "NN". 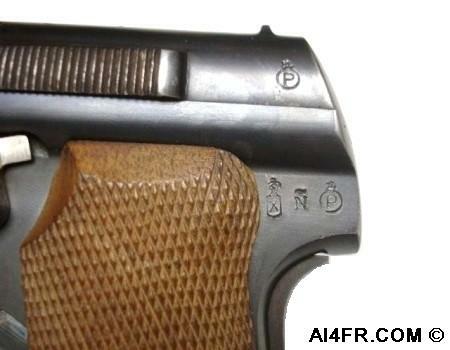 This indicates that this pistol was manufactured in 1943. This letter for the date code is still in use to this very day. The next symbol is the flaming bomb stamp with the letter P inside it which is also found on the left side rear of the slide as seen in the picture. This stamp was first introduced on December 14, 1929. This stamp will either have the letter P inside the bomb for semi-automatic pistols or the letter R for revolvers. The flaming bomb proof indicated that a semi-automatic pistol was fired and had passed two proof loads, each of which was 30 percent more then the normal maximum operating pressure. This is then followed by two more rounds fired at normal pressure levels to determine whether the self loading mechanism is still functioning properly, if it was, then the stamp was applied to the firearm. 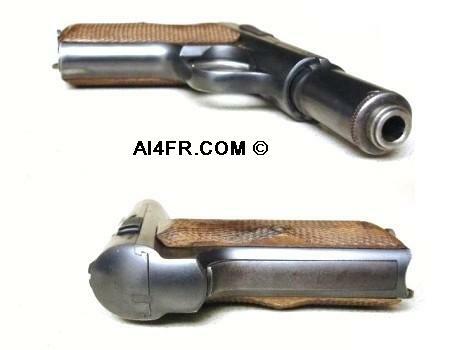 For a revolver, where reloading takes place by means of the turning of a cylinder, an over pressure load is used. An interesting note is that Spain took longer to establish national proofing laws and standards for firearms then some of the other important firearms producing nations, notably Austria, Belgium, France, Germany and Great Britain. 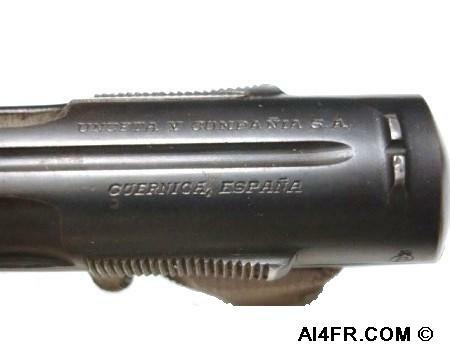 Although Spain began proof marking shotguns in 1910, it was not until July 18, 1923, nearly 5 years after the end of the first world war that Spain's proofing system for its pistols came into use. The photograph on the left is of the slide ejection port and here we can see the stamps on the outside of the barrel. At the top is 7.65 M/M and then underneath that is the flaming bomb with the letter P inside. 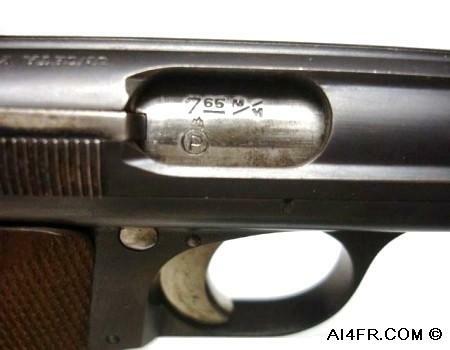 This set of marks tell us that the pistol is chambered for the 7.65 mm Browning cartridge which is also known as .32 ACP(Automatic Colt Pistol). The flaming bomb proof mark indicates that the pistol has passed test firing with a round that was 30% more powerful then normal. The picture on the right is of the inscriptions that are located on the top rear of the slide. On the right side of the slide top it is stamped "Unceta y Compania S.A." and then on the left side of the slide top it is stamped "Guernica Espana". The first stamp Unceta y Compania S.A. indicates Unceta(the manufacturer) and company Incorporated. The abbreviation "S.A." is basically the Spanish equivalent of "inc." or incorporated. It further can be explained with the Spanish words, Sociedad Anónima or Sociedad por Acciones. The stamp "Guernica Espana" indicates the location of the Unceta y Compania S.A. The town Guernica is located in the Basque region of north-central Spain northeast of Bilbao. Its April 1937 bombing by 28 planes from the German Condor Legion during the Spanish Civil War inspired one of Picasso's most famous paintings, called Guernica. The Spanish rulers at the time commissioned Pablo Picasso to create a large mural for the Spanish display at the Exposition Internationale des Arts et Techniques dans la Vie Moderne Paris International Exposition in the 1937 World's Fair in Paris. The painting Guernica shows the tragedies of war as well as the suffering that war inflicts upon individuals, and in particular, the innocent civilians. This bombing and strafing of Guernica destroyed three-quarters of the city but spared the Astra factory. How to field strip the Astra 300. 1. The first thing is to remove the magazine and make sure that there is not a round in the chamber. 2. The next step is to depress the barrel bushing that is located at the muzzle. This can be accomplished by using the floorplate of the magazine. 3. Turn the barrel bushing a 1/4 of a turn while applying rearward pressure as the bushing is under the recoil spring tension. 4. 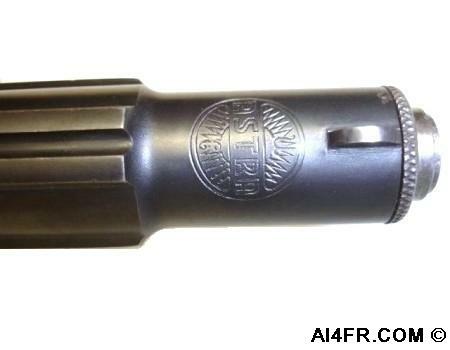 Now carefully ease the barrel bushing and lock off of the slide, and remove the recoil spring by pulling it outward. 5. Pull the slide back as if to put the pistol into battery and then move the slide forward and position it so that the indentations on the right side of the receiver and slide are lined up. 6. Rotate the barrel in a counterclockwise direction to the limit of its movement. 7. Lastly pull the slide in the barrel forward and off of the receiver.